Annual Parish Meeting 2018: read the draft minutes here and the Organisations Reports here. Each year an Annual Parish Meeting is held at which residents can air issues and ask the Parish Council to investigate certain matters which are of concern. It helps set the Parish Council’s priorities for the next year. 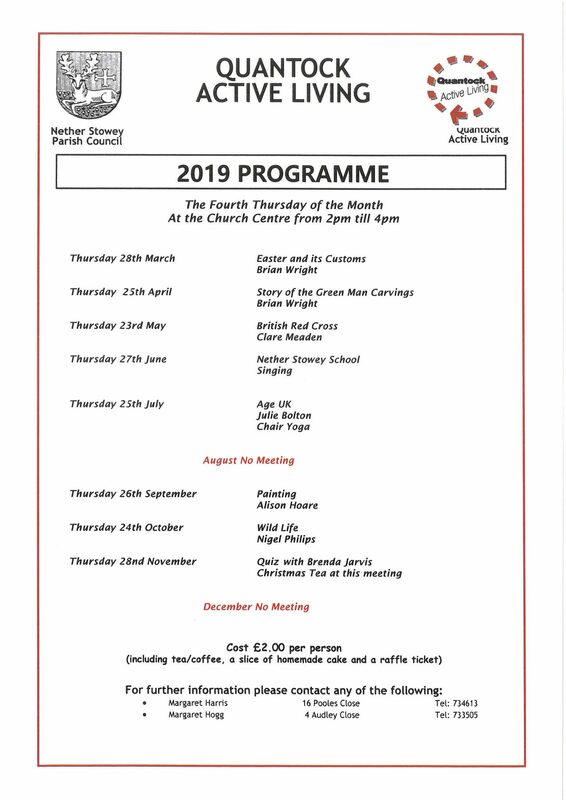 Although the event is NOT a formal Parish Council meeting it is facilitated and funded by the Parish Council for the benefit of the community. Anyone may attend but only registered electors of Nether Stowey Parish may speak and vote. For this reason please make sure you sign the attendance sheet. Any registered elector may ask questions of the Council, which will usually be answered by the Chairman, the Clerk to the Council, or a designated Councillor. An elector may also make suggestions and comment on anything pertinent to the people of Nether Stowey. This will be welcomed and is the whole purpose of the meeting. The meeting is organised by the Parish Council and the main point of contact is the Clerk. There are few formalities but the agenda is intentionally kept loose to allow electors plenty of time to raise their concerns. The Chairman of the Parish Council will chair the meeting. If the Chairman is not able to attend, the Vice-Chairman will replace him, and failing that then the meeting will elect a chairperson from amongst those electors present. Usually Parish Councillors attend and will speak if need be. But the purpose of the meeting is to enable the ordinary electors to have their say. Councillors will listen with interest and as electors themselves, also have the opportunity to raise questions and make comments if they wish. It is not always possible to provide a substantive response to questions on the day, so it is helpful to inform the Chairman or the Clerk beforehand, so that the Clerk can bring any necessary information to the meeting. A written record of the meeting will be taken and the minutes will be kept as a draft until the following year. Resolutions made at the meeting are not formally binding on the Parish Council, but will be considered at subsequent Council meetings. The meeting will last long as it needs to be within reason and usually no more than 2 hours. It really depends on those present and the number of questions and the discussion that is raised. Annual Parish Meeting 2017: read the minutes here and the Organisations Reports here. Annual Parish Meeting 2016: read the minutes here and the Organisations Reports here. Annual Parish Meeting 2015: read the minutes here and the Organisations Reports here. Annual Parish Meeting 2014: read the minutes here and the Organisations Reports here.